This ugly patch on a lock gate (patched in 2011) and the bright white cement of the “short-term repair” to the quoin (done in 2007) at Jones Falls are just two of the more visible issues related to lack of funding of the Rideau Canal. Note that these problems pre-date the current budget cuts which are only going to make these types of problems much worse. The patched gate greeted visitors throughout the 2012 season and was finally replaced with a new gate in late-November 2012. Big changes are coming to the Rideau Canal as a result of an extremely large budget cut and re-organization of the administration of the canal by Parks Canada. The cuts and re-organization are going to have a severe negative impact on the heritage preservation and presentation of the Rideau Canal. They are the largest and most severe changes to impact on the Rideau Canal in its 180 year history. The cuts were sparked by a 5% government mandated cut to the overall Parks Canada operating budget. Parks Canada has decided to make the cuts much deeper for its heritage canals. Park Canada’s CEO Alan Latourelle has stated that the cut to the Rideau Canal will be 2 million dollars, which represents over 20% of its current operating budget. A similar cut (3 million dollars - also over 20%) is being imposed on the Trent-Severn Waterway. The Rideau Canal and Trent-Severn Waterway are being merged into one operating unit to be called the Ontario Waterways Unit. These changes are of significant concern to Friends of the Rideau from both the natural and cultural heritage aspects of the canal. The potential negative impacts include water control along the entire Rideau Waterway, ecological protection concerns, heritage preservation of the Rideau Canal’s historic structures and heritage presentation of the Rideau Canal. We have been concerned for the last few years about issues such as heritage presentation and preservation, readers of this newsletter may remember the 2010 article “Has Parks Canada Lost Its Way on the Rideau Canal?”. These cuts will exacerbate those still existing problems. The Government of Canada is a signatory to the World Heritage Convention which states in part that it will ensure the "protection, conservation, presentation and transmission to future generations of the cultural and natural heritage" of the site "to the utmost of its own resources." The financing and management of the Rideau Canal World Heritage Site has to be framed within those two responsibilities. Is Parks Canada following its own mandate and is the Government of Canada supporting the Rideau Canal World Heritage Site “to the utmost of its own resources”? The answer to both those questions is clearly no. We are also deeply disappointed that Parks Canada has not done any consultation with the heritage community regarding their planned changes. The dramatic changes are going to impact on both on general heritage and World Heritage Status requirements, but we have no idea how Parks Canada is going to manage heritage within its new Ontario Waterways Unit other than it is going to do less than it does now. The cuts have already resulted in the loss of a significant portion of Parks Canada’s heritage support staff; historians, archaeologists and the like. The loss of this expertise has eliminated the capacity for Parks Canada to do more than superficial heritage management. The Rideau Canal was designated a World Heritage Site based on its cultural heritage values, it needs heritage expertise to properly manage everything from heritage maintenance to providing an authentic heritage experience for visitors. Visitors to the Rideau Canal are going to notice the loss of heritage focus by Parks Canada, including the closure of currently interpreted sites such as Sweeney House and the Blacksmith’s Shop at Jones Falls. Along those lines we’ve attended several meetings this summer dealing with the cuts to the Rideau Canal. Our Chair, Hunter McGill provided oral comments regarding our concerns at a meeting with MP Gord Brown in July. Hunter has also written to Minister Peter Kent (Minister of the Environment, in charge of Parks Canada) – you’ll find that letter in this newsletter. We’re also expressing our concerns to UNESCO about the threat to the World Heritage status of the Rideau Canal that the budget cuts and operational re-organization will bring. And of course the information in our newsletters has broad distribution outside of our immediate membership (politicians, heritage and environmental organizations, etc.). There is also a great deal of information on the web about the current issues and coming changes. Much of this can be found on the Save Our Rideau website, www.SaveOurRideau.ca. Please note that this site is not affiliated with Friends of the Rideau. Preventable sink holes beside Lock 40 at Jones Falls. The original highly obtrusive bright orange safety fencing that cordoned off the area has been replaced with slightly less obtrusive wire fencing. 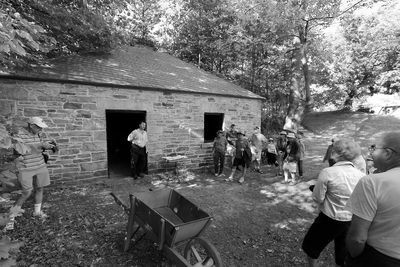 The popular Blacksmith’s Shop and Sweeney House at Jones Falls are just two of several sites along the Rideau that will no longer be live interpreted. 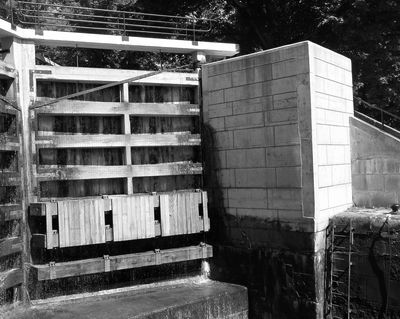 Repairs done in late 2011 with white cement and cheap modern aluminum steps overwhelm the heritage character of the stop log mechanism of the weir at Jones Falls. The Friends of the Rideau Board of Directors had an event-filled summer, with attendance at the usual festivals, boat shows and similar activities, as well as participation at public meetings to discuss the impact of the 2012 federal budget cuts on Parks Canada and the operation of the Rideau Canal. Elsewhere in this newsletter you will read reports on what we have been doing to communicate our concerns, not only about the impact of shorter hours and season, and skimping on maintenance, but also the growing neglect of the heritage character of the Rideau Waterway and Kingston Fortifications. We have been encouraged by the comments many have made when we talked with you at The Depot and at the meetings and boat shows, etc. we’ve attended. In all these encounters we have encouraged you to communicate with the minister responsible for Parks Canada, Peter Kent, and with your Member of Parliament. It is important that the government know how many people are concerned about the cutbacks to the Rideau Canal budget. On a happier note, Friends was very pleased to receive a grant from the Village of Merrickville-Wolford to help us operate The Depot for the full length of the visitor season in 2012. We have enjoyed a good relationship with Merrickville over the years and this latest support has been very welcome. We also were able to respond to a request from Borden Ladner Gervais LLP, one of Canada’s top law firms, to provide information on the construction of the Rideau Canal, in the form of 150 copies of the DVD of Robert Passfield’s brilliant study “Canal Lock Design and Construction: The Rideau Canal Experience 1826-1982” as well as the Parks Canada information pamphlet on the Canal and the brochure “Ottawa Locks Walking Tour.” These items were distributed by Borden Ladner at a client appreciation event for members of the Ottawa architecture, engineering and construction community in early June. Borden Ladner was very generous in its public acknowledgement of the role of Friends of the Rideau in supplying items for the swag-bag for attendees. We were also pleased to respond to a request from Parks Canada in the spring to re-supply copies of the brochure “How a Lock Works”, for distribution at all the lockstations along the Canal. This brochure provides a useful explanation for first-time visitors (and others!) as to where the water comes from to operate the locks and why the lock staff spend so much time cranking the crabs. Proof of the value of the partnership between our two organisations. The dormant period for the Rideau Canal, from now until the spring, is not a time for us to let up on our efforts to ensure the heritage character of the waterway is properly protected. If you love the Rideau, as we do, speak up now and let your elected representatives and Minister Peter Kent know of your concerns. The Friends AGM took place on May 12 in the auditorium of the Rideau Canal Museum in Smiths Falls. The Chair, Hunter McGill, gave a recap of the organisation’s activities since the last meeting, noting the difficult circumstances for Parks Canada in terms of budget – about which Friends had written to the Minister, Peter Kent back in July 2011 - and the growing pressures on Rideau Canal staff. While the Landscape Character Study was proceeding, and a number of Friends members and directors had attended the workshops, it was unclear as to what action would follow the eventual consultant’s report. Friends was also concerned about the further postponement of preparation of the Rideau Canal management plan. Elections for members of the Board of Directors for 2012-2014 were held and Ed Bebee, Dave Brett, Mark King, Hunter McGill and Ken Watson were elected directors of the Rideau Waterway Coordinating Association, Friends of the Rideau’s formal name. The featured speaker at the meeting was Professor Bruce Elliott, of Carleton University, a specialist in local and community history in eastern Ontario and western Québec. He spoke on the topic of “Squatters, Labourers and Tenants on the Rideau Canal.” Dr. Elliott’s talk, rich in detail, covered the early history of land ownership and use along the Rideau Canal and the challenges to researchers in identifying who owned, who rented and who simply squatted on lands along the Canal. Dr. Elliott enlivened his talk with a number of anecdotes regarding the not-so-praiseworthy methods used by some early inhabitants of Ottawa to gain possession of key plots for development. The presentation was a stimulating look at the colourful history of Ottawa and the northern stretches of the Rideau Canal and the interplay between land use and the shape of the landscape we know today. We had a good season operating the Depot in Merrickville, welcoming over 4,500 visitors during our 10 week season. While it wasn’t the best year financially, operating the Depot supports our mandate of informing the public about the wonders of the Rideau Canal. This summer, we engaged many visitors in conversation about all things Rideau. We also served as a tourist bureau for Merrickville, pointing people to various local establishments and handing out walking maps of the village. A great big thanks to Cheryl Gulseth who kept the Depot very well managed. Also big thanks to Emilie Paradis, our awesome summer student. We had a excellent volunteer help from Karleigh Pitura and Danny Proulx - so a big thank-you to Karleigh and Danny. Thanks too to FoR directors Ed Bebee, Dave Brett, Rowena Cooper and Hunter McGill who made time in their busy schedules to help out. And more thanks to Lockmaster Griff Cain and the Parks Canada lockstaff for their help and support. A popular feature of the Depot continues to be “The Loos,” providing public washroom service to Merrickville. Also popular was a soapstone carving display put on by Brian Walker and Jill Carty at The Depot during the Merrickville Car Show. We also helped with facilitating canoe and kayak rentals from Canal Tripping in Merrickville in order to get people out on the water to fully experience the Rideau Canal. We’re looking into expanding that service in 2013. One of the initial suggestions by Parks Canada to cut the budget of the Rideau Canal was to reduce the operating season. The rationale presented by Parks Canada was that the Rideau Canal is simply a recreational waterway and that they were subsidizing recreational boaters. To reduce costs they would shorten the season down to the peak boating period. Not mentioned or apparently considered by Parks Canada was the greater economic impact the canal has on the surrounding economy and the heritage value of the Rideau as an operating canal. The economic impact got a great deal of public attention since it affected so many people, basically everyone involved in the tourism industry in the Rideau Corridor and businesses such as marinas that depend on the full season. While shortening the season would save Parks Canada money it would in fact cost the economy of Canada due to its negative impact on tourism and local businesses. The case to preserve the current length of the season for the greater good of the economy was presented to politicians on both the Rideau and the Trent-Severn. Heritage is always a harder sell but of course it is the main reason to keep to Rideau Canal operating. The Rideau Canal is a World Heritage Site in large part because it is an operating canal. Parks Canada’s representation of the Rideau Canal as simply a recreational canal catering to boaters is incorrect. The main reason to operate the canal and lock through boats is to present the Rideau as a heritage canal, operating much as it did when opened in 1832. Boats being locked through is the most significant part of the heritage interpretation of the Rideau Canal to land based visitors. In fact, when the Rideau Canal was transferred from the Department of Transport to Parks Canada back in 1972, the Canadian Government stated that: “Under the Conservation Program there should be a shift in emphasis in the management of the canal systems from "transportation" to historic restoration, preservation and interpretation; natural environmental preservation and interpretation and the optimum use of federal lands.” That is how Parks Canada should be looking at and managing the Rideau Canal. Heritage does of course have huge economic benefits since many tourists come here to see the heritage aspects of the Rideau Canal, particularly how this marvel of 19th century engineering works. They want to see boats going through the locks and visit the heritage structures along the Canal, many operated by Parks Canada, and understand the history of the Rideau and its setting. So heritage, the operating season and the value of an operating Rideau Canal to the Canadian economy are all intertwined. This is not all good news for the Rideau. It is to be remembered that the 2 million dollar cut to the Rideau Canal’s operating budget is still in effect. Whatever savings not found from the changes to the operating hours will be taken from other aspects of the Rideau Canal’s operation. The many heritage issues that Friends of the Rideau are concerned about remain. The cumulative impact will increase over the coming years as the cuts are applied. Congratulation to Friends of the Merrickville Turbine who have assumed ownership of the turbine and plan to restore and interpret it. The turbine was installed in 1915, using waters of the Rideau Canal to generate power for Merrickville. Today it sits on display in the Industrial Heritage Complex in Merrickville. Plans are to have it re-painted and interpretive signage put up by mid-2013. I am writing to convey the concerns of Friends of the Rideau regarding the impact of the proposed cuts to the budget of Parks Canada as they apply to the Rideau Canal National Historic Site and UNESCO World Heritage Site. The members of Friends of the Rideau are very concerned that measures being considered to meet arbitrarily set budget reduction targets will result in a lessening of Canadians’ opportunities to enjoy an important part of their heritage and appreciate and understand their history, as well as putting at risk the integrity of the Rideau Canal itself. Moreover, at a time when this region, like many others throughout Canada, are relying on tourism as an economic driver, creating private sector jobs, any attrition of the operation of the Rideau Canal will have a negative impact on the economy of eastern Ontario. Friends of the Rideau, an organisation made up of volunteers passionate in their support for and concern for the Rideau Canal, works to enhance public awareness of, knowledge of and enjoyment of this national treasure. As you can understand, the heritage significance of the Rideau has a great deal to do with the place the Canal holds in the life of eastern Ontario. The budget cuts proposed will erode the accessibility of the Rideau Canal heritage to thousands of visitors. It will call into question your government’s commitment to protecting and preserving that heritage and enhancing visitors’ opportunities to visit and appreciate an operating early 19th century canal whose construction brought together the founding populations of Canada. It is much more than just numbers of boaters. Parks Canada must ensure it has the capacity to meet its mandate of protecting and presenting the natural and cultural heritage of the Rideau Canal to all users and visitors. 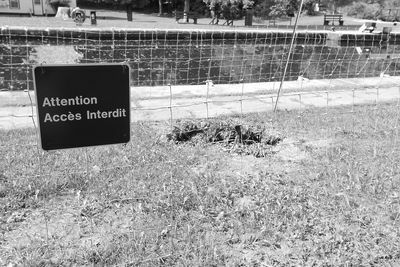 If Parks Canada’s responsibilities for the Rideau Canal are reduced to water management, boating operations and maintenance, there will be little heritage value and integrity and no interpretive capacity to attract visitors, whether Canadian or international. The international aspect is significant as it has been suggested that one important consequence of neglecting the heritage significance of the Rideau Canal could be the loss of UNESCO World Heritage Site designation. The World Heritage Committee is currently evaluating the management and operation of this new World Heritage Site. It would be a major blow if it decides that Canada has abandoned its responsibility to protect this important part of our cultural heritage which illustrates so well human creative genius, captures a significant historic landscape and has outstanding universal value. In particular, the decision to designate the Rideau Canal as a World Heritage Site recognised the continued operation of the canal system as a demonstration of living heritage and it is this which is threatened by the proposed attrition of service. Friends of the Rideau urges you, and your Cabinet colleagues, to ensure that cuts to the Parks Canada budget are applied fairly to the Rideau Canal and to ensure that, while important changes are being made to improve the management efficiency of the operations of Canada’s historic canals, the heritage character and historic value of the canals, especially the Rideau, are protected. Shortening the operating season, arbitrarily reducing hours of service, and eliminating heritage interpretation services are the wrong way to discharge our responsibilities as stewards of Canada’s history. If the front-line staff of Parks Canada at the Rideau Canal are given a mandate to work with local partners in the private and voluntary sector, and allowed sufficient time, we are confident that ways can be found to preserve Canal operations at current levels, preserve jobs in the private sector, protect and present the heritage values of the Rideau and raise additional revenue through innovative arrangements which will enhance Canadians awareness of and appreciation for this jewel in the crown of Canadian heritage. Friends of the Rideau would welcome the opportunity to be part of a dialogue between Parks Canada and private sector and voluntary sector partners to develop a plan to achieve those objectives. Parks Canada is merging the operation of the Rideau Canal and the Trent-Severn Waterway into a new unit called the Ontario Waterways Unit. This new organization will have an operating budget that is 5 million dollars less than the current combined operating budget of the Rideau and Trent-Severn. The two Superintendents of the Rideau and the Trent-Severn will be replaced with a single “Director.” That position has not been filled, the current Superintendent of the Rideau Canal, Don Marrin, will act as Interim Director prior to his move to a new position within the National Parks side of Parks Canada. The Quebec heritage canals are also being merged (the Quebec Waterways Unit) and there will be an Executive Director at headquarters in charge of both those units. That person will be Darlene Upton, currently Director of Law Enforcement with Parks Canada and with no background in heritage canals. We have some deep concerns about the merger of the Rideau and the Trent-Severn since they are two very different systems, particularly with regard to heritage. At a superficial level, which is apparently what Parks Canada is looking at, they are recreational canals. But the Rideau is older than the Trent-Severn, it was built for military purposes, it is a World Heritage Site, and the community issues and culture along the Rideau are much different than the Trent-Severn. We do not know, either officially or unofficially, how Parks Canada plans to manage the natural and cultural heritage requirements of the Rideau Canal within the new structure. The ecologist’s position within the Rideau Canal Office has been “surplused” (position terminated) and there never was a heritage manager. Most of the heritage support people within Parks Canada have also been surplused. With the loss of that expertise it is very unclear at the moment if Parks Canada has the capacity to properly manage the natural and cultural heritage obligations of its own mandate or the World Heritage requirements of the Rideau Canal. On a sad historical note, this change by Parks Canada is also breaking a continuous run of 180 years of having a Superintendent of the Rideau Canal (the first Superintendent was Lt. Colonel John By). While that role, originally as the Superintending Engineer of the Rideau Canal, has changed over time, the Rideau has always had a direct manager in that position. The Rideau Canal is a highly complex system to operate and the management level of Superintendent is needed in the field unit on the canal. A former Superintendent of the Rideau Canal, John Bonser, made it very clear this summer that the position of Superintendent of the Rideau Canal is more than a full time job. The new Super Superintendent (the Director of the Ontario Waterways Unit) will face major challenges in doing the job properly, trying to manage two large canal systems with a dramatically reduced budget. The other issue of concern to Friends is the lack of a Management Plan. The current Management Plan was supposed to have been updated in 2010. We were told the delay in getting it updated was to synchronise issues in the plan with the other heritage canals. It is apparent now that the concept of merging the canals was already in the works at that time. Parks Canada invited a great deal of meaningful public engagement with the past two Management Plans, but there has been no such engagement with the large changes now being proposed. We’ve been told that there will be a new Management Plan and that there will be public input, but of course this will all be after the fact. The current re-organization is taking place with no public input and no transparency. The Rideau Corridor Landscape Strategy was sparked by a 2006 ICOMOS recommendation, in their evaluation of the Rideau Canal’s application for World Heritage Status, to conduct a visual values study of the Rideau Canal and to implement protection of those values. The visual values study continued this summer, as part of the Landscape Strategy consultant’s work, with an on-line visual preference survey as well as five workshops that conducted the same visual preference survey. The results from these surveys were incorporated into a report that the consultant is preparing for Parks Canada. One disappointment is that it was specifically stated in a Landscape Character workshop that a draft of the report would be available for public review in October - it was to be posted on the Rideau Corridor Landscape Strategy website. That didn’t happen, instead the draft was submitted directly to Parks Canada, the Steering Committee and the Planners Technical Advisory Group for their review. Since the all-government steering committee never formed a public advisory group (which was supposed to be part of the governance model), and the draft report has not been made available for public review, it is now being completed with no public input outside of the simple visual preference survey. The Rideau Corridor Landscape Strategy is to have two components. The first is to identify the "visual values" of the Rideau Canal. That is the study now being completed. This study, while it includes digital components that can aid township planners, does not offer protection. The second component is "protection," by which ICOMOS means legislation or other legally binding methods. So the next stage of the process is to implement protection of the visual values of the Rideau Canal. It is unclear at this time if Parks Canada intends to work at implementing the protection component that ICOMOS recommends. On a slightly brighter note, a small, but positive step supporting protection is the specific mention of World Heritage Sites in the draft of the new Ontario Provincial Policy Statement covering development planning. The Provincial Policy Statement provides direction for things such as Municipal Official Plans. While the Rideau is not mentioned, it is the one and only World Heritage Site in Ontario. We can give Parks Canada credit for taking the initiative to get World Heritage sites specifically mentioned in the Provincial Policy Statement. That good initiative was supported by letters from Friends of the Rideau and several individuals back in 2010. This spring marked the completion of the digitization of our tenth book on CD - the Parks Canada manuscript report “The Architectural Heritage of the Rideau Corridor” by Barbara A. Humphreys. Barbara, a member of Friends of the Rideau, was the initiator of this digitization effort. Her 1974 report looks at the rich architectural heritage of buildings in the Rideau Corridor. The number of vessel passages through the locks in 2012 was down 3.2% compared to 2011 (64,010 vs 66,113). This, as the above chart shows, is the second lowest level in 30 years. The precipitous drops on the chart are caused by shutdowns of the Rideau Canal: the closure of the Ottawa Locks in 1983 (due to reconstruction) and strikes that shut down the canal in 1991 and 2004. Longer term drops are caused by uncertainty. The drop in the early 1990s was due to a combination of the strike and budget cuts. The boating numbers did stabilize at that point until the next strike in 2004. The current cuts and uncertainly have the potential to drop the boating numbers again. The Rideau needs stability and extensive marketing by Parks Canada to boaters - two things that are currently in short supply. The use of the slackwater canal construction technique was used in part for the building of the Erie Canal ten years prior to the Rideau. It was also used in Europe for parts of a few canals built prior to the Rideau such as the Caledonian Canal in Scotland and Gota Canal in Sweden. But the Rideau took slackwater building to a much larger scale than applied in Europe, and the original slackwater elements survive to this day (unlike the Erie which has been rebuilt). Why did Colonel By prefer the slackwater technique over the conventional technique of digging ditches around rapids? Because it was less expensive and faster than the standard ditch-digging canal building method. But it was a technique that had restrictions, it could only be used in an area where the rivers were small enough to be spanned by the dam-building techniques of the day. Fortunately he had three such rivers along the Rideau route; the Rideau, White Fish, and Cataraqui rivers. In fact parts of the White Fish and Cataraqui rivers already had an example of slackwater navigation, a navigable depth of water created between the two rivers by the building of mill dams at White Fish Falls (Morton) and the Round Tail (near Upper Brewers) in the early 1800s. 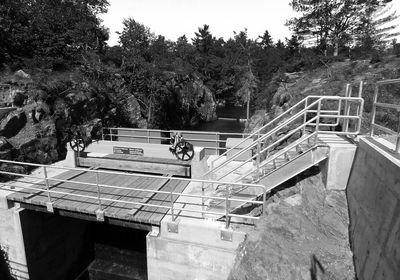 One of the advantages for Colonel By of the slackwater technique was the ability to construct locks “in the dry.” Virtually every lock along the Rideau Canal, with the exception of the “river locks” at Kingston Mills and Ottawa, were built above the pre-canal water level. This meant that coffer dams were not required for the construction of the locks and in most cases, significant pumping of water was not needed. The dams of course had to be built “in the wet” – but that was easier and cheaper than having to do locks in the wet (with the notable exception of the Hogs Back dam). There was a financial downside to the slackwater technique and that was the requirement to pay landowners compensation for flooded land. The land along the Rideau route had been land-granted prior to construction. Although many were absentee landlords, all were entitled to compensation. The Rideau Canal Act, passed in 1827, allowed Colonel By to expropriate land for the Rideau Canal, with compensation to be settled in court after the completion of the canal. The other downside for that era was the lack of a tow path which was normally built alongside a canal cut so that a draft animal could pull the non-powered boats of the day. But Colonel By was building a steamboat canal, he didn’t need tow paths, so this was not a negative on the Rideau. The slackwater system, in addition to being historically significant and one of the reasons for the Rideau’s World Heritage designation, also shaped the usage of the Rideau. The drowning of rivers created new lakes. The drowning of forests created habitat favoured by some fish species, most notably the Largemouth bass. It was these bass that helped spawn the start of recreational use of the Rideau Canal in the late 1800s. Paddlers enjoy the scenery of Whitefish Lake, a lake first created by mill dams and then greatly expanded by the building of the Rideau Canal. It flooded an area of forest through which the White Fish River used to run. For more information contact: Friends of the Rideau, 1 Jasper Avenue, Smith Falls, Ontario K7A 4B5 – Tel: 613-283-5810 – Email: info@rideaufriends.com – Website: www.rideaufriends.com.